Philadelphia Eagles Bryan Braman is a 6-foot-5-inch, 241-pound defensive end with a heart that is bigger than his stature. Braman certainly has a lot on his mind this week as he and his team mates prepare for the Super Bowl. Yet, he eagerly took time out to embrace his fans and autograph footballs to help raise money for children, teens, and adults with autism. 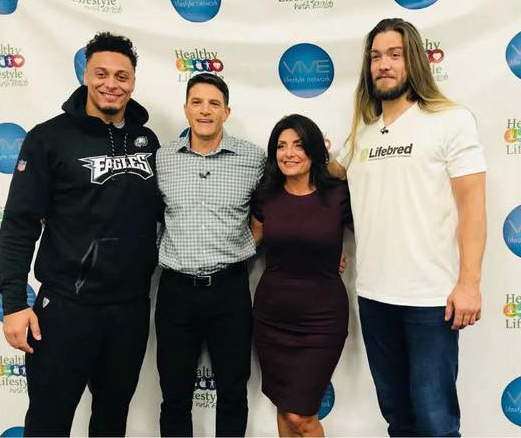 The occasion was a taping of a Super Bowl segment with the two Eagles players of “Healthy Lifestyle With Eraldo,” a cable TV show focused on health and fitness. At WMCN in Cherry Hill, N.J., TV show host Eraldo Maglara said that like everyone else in the Tri-State area, he is caught up in Eagles Super Bowl Fever, and was a little awe-struck by his guests. Maglara was joined by author and Real Housewives of New Jersey (RHONJ) reality TV star Kathy Wakile, as his special guest host. 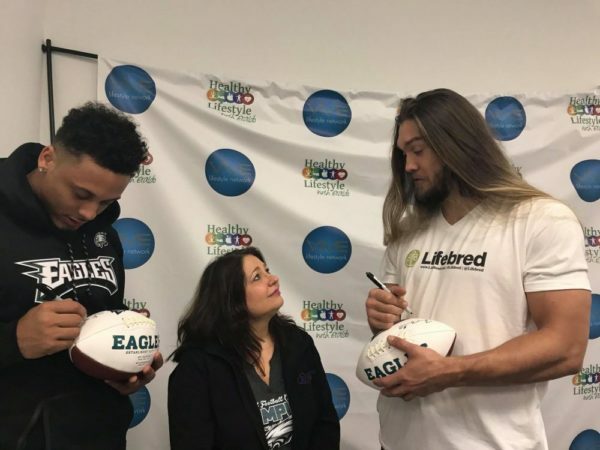 On Tuesday, Jan. 23, Braman and Eagles Tight End Billy Brown autographed the footballs for Linda Kuepper, Co-Founder and CEO of the Autism Cares Foundation. These items will be auctioned off at the non-profit’s 10th “Diamond” Anniversary Celebration on April 21, in Bucks County, PA. Joining the players was their agent, Sean Stellato, who like everyone else, was counting the days until the Big Game. Stellato is the author of “No Backing Down,” the inspirational story of the 1994 Salem High School Football Team. Bryan Braman, who proudly wears Eagles number 50, grew up in Spokane, Washington, was signed as a special team player by the Houston Texans in the middle of the 2011 season, and became a fan favorite during the three seasons that he played there. He spent the next three years with the Philadelphia Eagles, before being signed by the New Orleans Saints in March 2017. He was released in September of the same year, just in time to come back to the Eagles, and help them get to the Super Bowl. The 30-year-old doting father of two daughters; Marlowe Mae, 2, and Blakely, 4, Braman said that he is passionate about fatherhood, and loves being able to share his team’s recent win and Super Bowl journey with them. 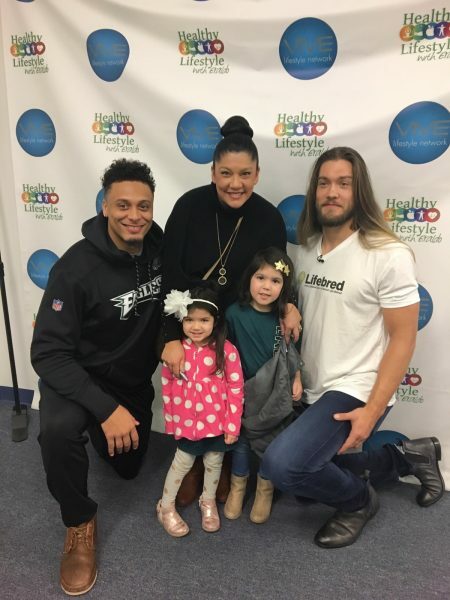 The following is an exclusive Jersey Family Fun interview with Bryan Braman about family, football, the importance of being a role model, and sage advice for young children who want to follow in his footsteps. Do you have a message for your fans who are clearly experiencing Eagles Fever? What does all this love feel like? Bryan Braman BB: It’s unbelievable. The city of Philadelphia definitely deserves it. I think it’s great for the city and we’re going to give them and all of our fans a good game. What is your advice for a young child who might want to follow in your footsteps, but maybe is a little afraid or not athletic? BB: Yeah, you have to listen to yourself. If you don’t believe in yourself, then nobody else will. So, just know what you want, make sure that you put 100 percent of your effort into it. Don’t allow any of the naysayers or the outsiders to tell you that you can’t do it. Just pursue your dreams; and never give up! Would you want your two daughters to go into sports? BB: Yeah, I would definitely want them in sports. I would probably prefer them to go a different route than the physical, degrading, sport of football, but I’m going to support my kids in anything they do. 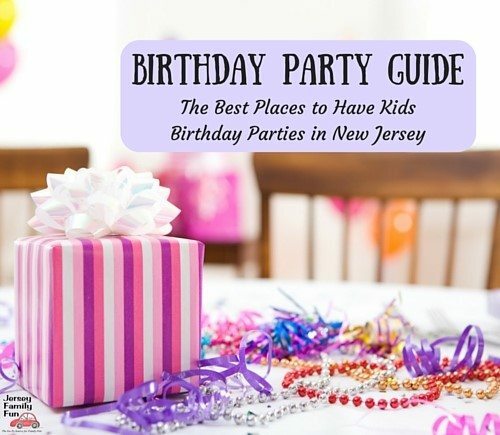 Do your daughters go to the Eagles games? BB: They do. That’s why we were running a little late today, because we were given all of the hotel and travel information. So, I wanted to make sure that my family was taken care of, that we had all the plans, and everything worked out because they’re coming from Austin, Texas. Since they’re not actually here in Philadelphia, there’s a little bit of extra planning that goes into it to make sure that they’re there, so they can experience it with me. So, I am curious — what kind of dad are you? BB: An amazing dad. [He smiled]. Totally hands on. I love my daughters more than the world itself. I love spending time with them. They love the zoo, and we do outings like that as much as possible. They love jumping parks, and my girls are actually quite athletic for their ages; four and two. So, my aim is being able to get them outside as much as possible, like I was when I was a kid. I truly love being able to do all of that stuff with them. How important is it to have family there rooting for you, wearing the team jerseys and just being there for you? BB: You know; they are your support system and they have a lot to do with why you do it and how you came about doing it yourself. It’s as much of a payoff for them as it is for me. The energy that it brings for me, obviously, knowing they’re in the stands watching me, the support and the love, that gives me a little bit of extra energy, and the oomph to go out there and really lay the hat. BB: I couldn’t be in any better head space right now. BB: Obviously, Super Bowl LII; it’s unbelievable. What is it 13 years since the last time the Eagles have gone? Obviously, a lifelong goal for anybody that plays in the NFL and just a humongous stage for all of us. You have been talking about healthy living today and part of that has to do with sleep. Have you had trouble sleeping since the big win on Sunday night? BB: It’s been difficult. Just because my mind’s obviously running a million miles a minute, trying to take care of family and make sure that everybody I love and hold dear to me is able to share the experience with me. How much of it is adrenaline out there? BB: On the field? I’d have to say a little bit of pre-workout and mostly adrenaline. I can’t even imagine. I’m going to have to really talk to myself and make sure I don’t hyperventilate because I’m one of those crazy guys that really get worked up before the games. Sometimes, I’ll be seeing spots before I’m actually out there on the field, so I just try to stay calm and keep on. When you saw your four-year-old daughter shortly after the big win, what did she say? BB: She said, ‘Good game, Daddy.’ It just hit me so hard that I actually broke down in tears. It was a good feeling. I know she doesn’t really understand the game that much, but to hear those words come from her means the world to me. Watch Bryan Braman when the Philadelphia Eagles take on the New England Patriots Sunday, February 4, 2018 in the Super Bowl.